The sign of Pisces is associated with compassion, imagination, mysticism, and spirituality; it is the sign of unconditional love. A water sign with an emphasis on emotions, intuitive thought and idealism, Pisces is ruled by the planets Jupiter and Neptune. Issues involving the seas, chemicals, charities, institutions of confinement, plots, and secrets become emphasized during Pisces. The house holding Pisces in the natal chart shows an area of life where one might be easily deceived, prone to escapism or self-sacrificing, where one would show artistry and imagination, or be especially sensitive to the moods of others. 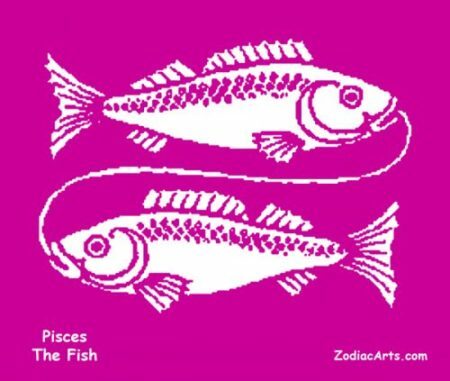 Pisces symbol: two fish, usually swimming in the opposite direction. 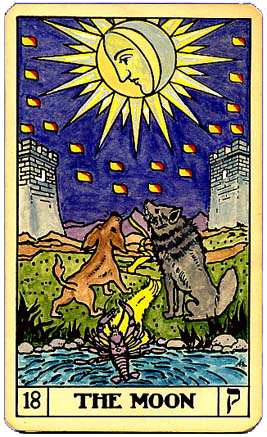 Attune to the qualities of Pisces with 3-minute tarot meditation on The Moon. Carol Bridges calls the 18th tarot card the “Infinity Within”. The Moon card correlates to the sign of Pisces and teaches us to use the power of imagination. Through Piscean energy we learn to visualize spiritual ideals in order to project them into physical form. Confer with The Moon to develop your creative imagination or to enhance your intuitive abilities. Pieces Sits in the East-North-East on the Medicine Wheel. Pisces correlates to Purity, the final step on the Northern pathway of Sun Bear’s Medicine Wheel. The cleansing and renewal processes of the Capricorn and Aquarius cycles leads to wholeness (free from impurities) and the ability to rest and dream in a state of Oneness with All That Is.